"So come up to the lab/and see what's on the slab/I see you shiver in antici... pation." It has been said that true classics are never appreciated in their own time. Movies like It's a Wonderful Life, Citizen Kane and The Shawshank Redemption each failed to generate much revenue in theaters but later went on to great success. No film has followed that trend more than The Rocky Horror Picture Show. While bombing in its original release, the film has grossed nearly all of its $134 million dollars in the years after its original debut. a newly engaged couple, Janet Weiss (Sarandon) and Brad Majors (Bostwick), get a flat tire while out driving at night. 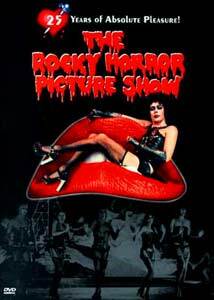 They remember passing an old castle, so they go back and meet its owner—Doctor Frank-N-Furter (Curry), a transvestite who's working on creating the perfect man. With his previous creation, Eddie (Meat Loaf) on ice, Frank-N-Furter has created a new and improved, muscle-bound man, Rocky Horror (Hinwood). What Brad and Janet don't know is that the mad doctor and his staff, Riff Raff (O'Brien) and Magenta (Quinn), are actually space aliens from transsexual Transylvania. As Frank-N-Furter shows and plays with his creation, Brad and Janet can't believe what they've stumbled into. I will admit that I have never seen The Rocky Horror Picture Show with audience participation. I know that the film doesn't work unless you see it at a rundown theater in a room full of drag queens. But you can't look past the fact that this movie isn't really that good. There are some worthy songs like Damnit Janet and The Time Warp, but a lot of the music is just about horrible. I am not the world's biggest fan of musicals, but I do enjoy them and Rocky Horror is nowhere close to the caliber of Singing In The Rain or South Pacific. Director Jim Sharman was never heard from again in Hollywood after the release of the film's sequel, Shock Treatment, and deservedly so. His direction lacks a necessary flare. There are moments where he shows originality, but they are limited and the only true achievement Sharman can be credited with are the elaborate dance numbers. The music is, as stated above, tolerable, and the set design deserves praise. Rocky Horror doesn't call for great performances, but Tim Curry camps it up as the good Dr. Frank-N-Furter, while both Barry Bostwick and Susan Surandon are adequate as the couple that stumbles into hell. Richard O'Brien , Meat Loaf, and Peter Hinwood each hand in decent supporting performances. Image Transfer Review: Presented in anamorphic widescreen with the original 1.66:1 aspect ratio, this film has never looked better. This THX transfer is free of any dirt or scratches and only shows a few problems here and there. Sharpness and detail are spot on and the black levels are perfect. There is no pixelation at all and the edge enhancement is kept to a minimum. This is a great transfer. Audio Transfer Review: This 25th anniversary disc contains both the original 1.0 mono track as well as a newly remastered Dolby Digital 5.1 track. The 5.1 mix is tamer than I would have liked, although the surrounds do come alive towards the end of the film. This is primarily a front channel mix with wide separation between the front three channels. Dialogue is clear and very understandable and there is very little bass, which is a disappointment considering the numerous musical sequences in the film. Extras Review: A commentary featuring actor and writer Richard O'Brien and Patricia Quinn is offered and it is a really good track. The two share a lot of insights and anecdotes and have good chemistry between them. The disc also contains an optional audience participation track, which lets you feel what it is like to see a film with a live audience. The rear channels are used to create this live feeling, with cheers and boos: if you get a lot of people together it can be fun. There is also a participation prompter, which tells you on the screen what to do when you are recreating the audience participation. The second disc is where the biggest chunk of features can be found and for any fan of the film this disc is amazing. First, a 30-minute documentary called The Rocky Horror Double Feature Video Show" offers some insight behind the phenomenon. It tells the origins of the film, as well as the play and the cult following that the film has received. Two deleted musical numbers are also offered: Superheroes, which is included in the UK version of the film, as well as Once In A While. Eleven alternate takes from the film are presented, but they seem to be different angles of the versions used. Two VH1 shorts can be found on the disc as well. The largest and most interesting of them is a Behind The Music special that includes numerous interviews with the cast and crew. There is also a "Pop Up Video" segment that features Meatloaf's Hootie Patootie and an alternate credits sequence using Time Warpas the music selection. Two songs are used as sing-alongs on the disc—Toucha Toucha Touch Me and Sweet Transvestite—subtitled without vocals . This is fun when you have alcohol and friends - trust me. The DVD also contains DVD-ROM content but I sadly can't access it. Rounding out the disc are two trailers for the film and a photo gallery that contains production stills as well as album covers. If you are a fan of this film, by all means get this disc. But if you are like me and have never seen the film, by all means see it at a midnight showing, then make up your mind. The extras make this disc worth a look and the great transfer is hard to resist. Recommended for fans of the film.